Mount Polley Mine has removed 350,000 tonnes of tailings in a 13.9-hectare area and restored 1.25 kilometers of fish habitat as part of its ongoing remediation of areas impacted by the 2014 tailings impoundment breach, environmental supervisor Colleen Hughes said. 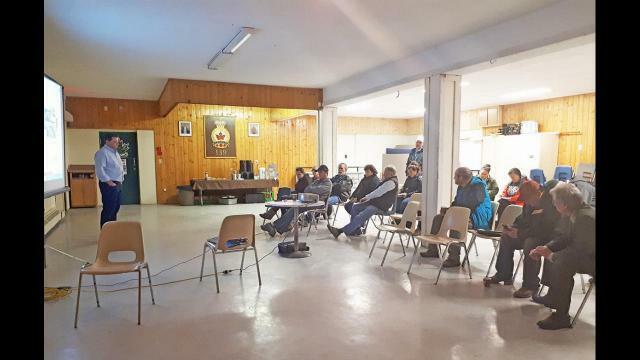 Hughes was speaking at a community meeting hosted by the mine at the legion in Williams Lake on Nov. 16 that attracted 16 people. Lee Nikl, senior environmental scientist with Golder Associates, outlined remediation monitoring that has been completed so far and considerations Imperial Metals is taking as the work continues. A human health risk assessment completed and submitted by Golder has been accepted by the Ministry of Environment and an ecological risk assessment is being finalized, Nikl said. As a result, the mine identified nine remediation areas that included the plug at Polley Lake, Polley Lake, the tailings storage facility, upper Hazeltine Creek, Hazeltine Canyon, Lower Hazeltine Creek, Edney Creek Mouth and Quesnel Lake, Nikl noted. “For each of those areas we’ve come up with a table to see what are the problems, what do we know is wrong, what is it that we already know that will inform the decisions that we make, and what do we need to know to do in the short-term and what do we think we will do in the long-term. Quesnel Lake resident Doug Watt said he knows the pristine quality of the lake prior to the breach has not been restored. Responding chief scientific officer Lyn Anglin said a research group from the University of Northern British Columbia has sent lake sediment core samples to a lab in the United Kingdom for further research. Anglin said it is difficult to make comparisons because the data prior to the breach is very limited, but if there are things people think the monitoring programs are missing, Mount Polley is open to suggestions. Watt said people on the lake know the slime, which they call “rock snot,” was not there before. Nikl replied that water quality guidelines are only one of the measures used for monitoring. “We look at many other measures such as invertebrate, toxicity testing in solid phase and water phase,” he said, noting ongoing geochemistry studies are looking at whether the copper is being released from the bottom of the lake. Hughes encouraged people at the meeting to read the technical and monitoring reports that are available on the Imperial Metals website.